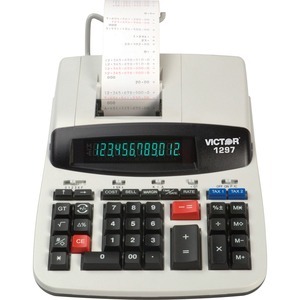 12-digit heavy-duty printing calculator with equals/plus logic features a large, two-color backlit display with negative numbers in red. Design includes large, well-spaced contoured keys with PC Touch and left-side total key. Print 4.0 lines per second in two colors. Calculator delivers large print on paper tape. Enter two cost/sell/margin variables, the third appears and prints. Functions also include tax set and tax +/-, four-key independent memory, change sign key, delta percent, grand total key, item count, add mode, date/nonadd and automatic constants. Calculator runs on AC power.